When you can use the microbuses? Saturdays, Sundays and holidays from 7.00 a.m. to 6 p.m. (but on the first Saturday of each month the transport services can be used from 7.00 a.m. to 10.00 p.m.). Who can use the transport services? people with visible reduced mobility, including people in wheelchairs in the first place. other disabled people recognised as being disabled due to reduced mobility. 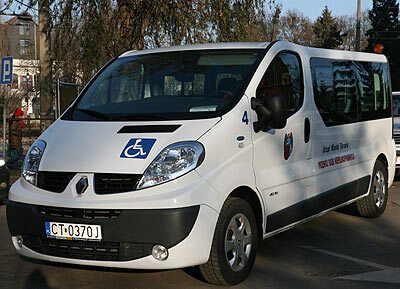 The passenger has the right to receive free help from the driver when getting in and getting off the bus and in the case of people using wheelchairs, from and to the entrance door to the building, in the buildings in which there is no lift or to the lift door in the buildings equipped with a lift. A person is charged a different fee depending on the type of disability. The fee ranges from PLN 0.71 or PLN 1.14 per 1 km (+ an initial tariff of PLN 2.64). The difference in the costs (the actual cost of 1 kilometre is PLN 3.85) is funded from the city budget. The carer of a disabled person is entitled to a free pass. How to order the transport services? The transport services can be ordered on an ongoing basis, but it is best to do it in advance. Sometimes it happens that the dispatcher has to refuse to accept the order; this can happen when it cannot be fulfilled. In such situation the dispatcher will explain the reason for the refusal to the ordering person. The refusal to accept the order usually happens in the hours of the morning and afternoon traffic peaks (a large number of requests), as well as in the event of failure of one of the vehicles.